I love Rachel Hawkins' Hex Hall Series. I devoured the first two books like they were candy. Hilarious swoonworthy candy. And my favourite character, clearly Sophie! What's not to love about a hilariously sarcastic girl with badass powers! I CANNOT wait for Spell Bound! I love this series. They are so funny and you just rip right through them!! I love Sophie, but I also loved her roommate so much in Hex Hall! 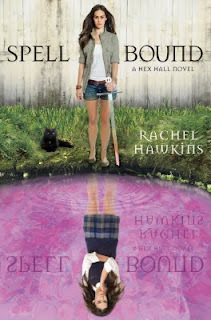 I'm looking forward to reading SPELL BOUND It does look amazing. Love the cover. It's going to be so so awesome!!!!!! I adore this series! As much as I'm a fan of Sophie and her killer attitude, my favorite character would have to be Archer Cross. Sophie is great, but I've got a real soft spot for Archer. I can't wait for Spell Bound to come out!